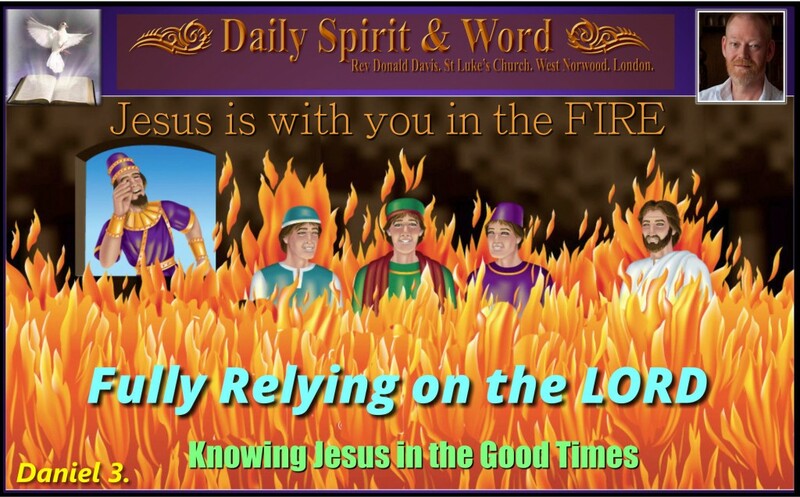 429: Fully Relying on God: In Life Threatening Situations. 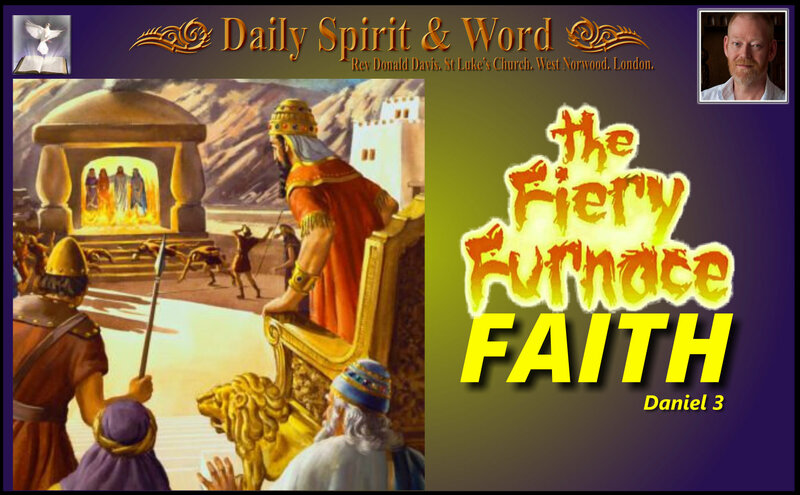 Yesterday we read through Daniel 3, the account of The Golden Statue set up by King Nebuchadnezzar, he gave an order that everybody from every nation should bow down and worship the statue (idol), but some of his wise men noticed that the Jews, namely; Shadrach, Meshach and Abednego didn’t comply with the order. As I meditated upon this chapter yesterday, I wondered what might possibly have made these Jewish boys to bold? What could have made them willing to loose their lives? Then reflecting back over chapter two, when Daniel told them to pray when they were once again in danger of loosing their lives, they prayed and the LORD gave Daniel the King’s Dream and it’s meaning. Then the answer came to me, it wasn’t only Daniel who got the REVELATION, but also Shadrach, Meshach and Abednego, because they knew the LORD speaks to people when they pray, they knew from experience that God listens, that God is alive, that God acts when people devote themselves to His cause, His honour, His glory. Whenever we face a perplexing or dangerous or troublesome decision, what have we go in our bag of spiritual goodies that will enable us to be bold, decisive and devoted to the LORD? We need our own REVELATION from the LORD of who He is, what He is like and how we can trust in Him. 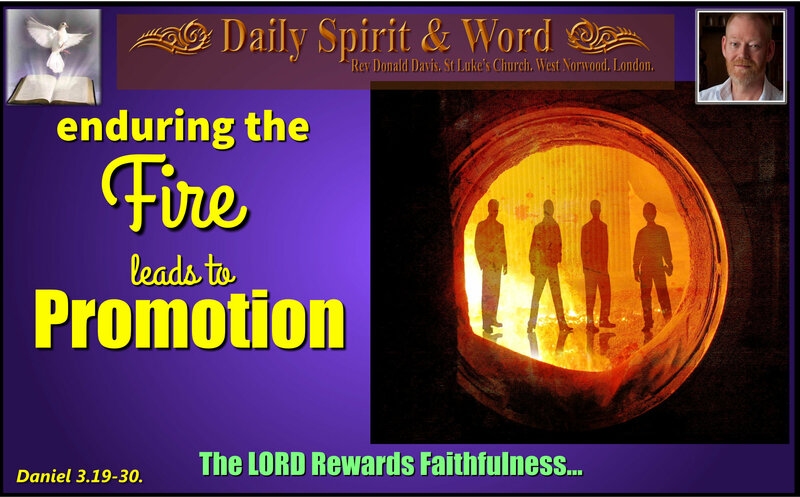 Just like Shadrach, Meshach and Abednego, we’ve probably all got little miracles that have proved to us God loves us, he listens to us, he acted in the past in our life and that encouraged our faith and our commitment to Him. Therefore, like Shadrach, Meshach and Abednego, we’ll turn to prayer, praise and worship for a solution in those difficult situations. Knowing God and knowing His ways are KEY, but so is being prepared to take a stand against our enemies when they rear their ugly heads. Think about those poor brothers and sisters in Christ in Iraq and Syria, Christians who rather than being forcefully converted to Islam chose to die rather than live a lie. They knew Jesus Christ as LORD and couldn’t deny Him. Their love for the Lord was much stronger than their fear of death. They knew like Shadrach, Meshach and Abednego that the LORD would either rescue them or honour them in Paradise, but even if they lost their lives they’d live forever in Heaven with Jesus. Shadrach, Meshach and Abednego are wonderful examples of fully relying upon God in the face of imminent death. Well, we know the story, how they were thrown into the fiery pit but survived in such an amazing, awesome and astounding MIRACLE. Their clothes didn’t even smell of the smoke of the furnace. WOWzer! 5 having a form of godliness but denying its power. Have nothing to do with them. 7 always learning but never able to acknowledge the truth. 8 Just as Jannes and Jambres opposed Moses, so also these men oppose the truth—men of depraved minds, who, as far as the faith is concerned, are rejected. 9 But they will not get very far because, as in the case of those men, their folly will be clear to everyone. 13 while evil men and impostors will go from bad to worse, deceiving and being deceived. 17 so that the man of God may be thoroughly equipped for every good work. So there will be, I’m sure, times that we’ll have to take a stand and that might mean paying a price for being a true Christian who loves the LORD. Let’s make certain now, before it happens, that we’re walking closely with Jesus Christ, that we’re praying for His powerful hand in everyday situations, then make a note of His; answered prayers, moving in situations, revealing His secrets, showing and guiding us by His Holy Spirit, then when the times of testing come, we’ll be ready to show the whole world that we love Jesus even more than we love our precious life and this place that we live now, is, like Shadrach, Meshach and Abednego, a place of exile, a foreign land and we are aliens, foreigners and strangers here, because our real HOME is in Heaven with Jesus forever. NOTE: Can also be read on St Luke’s Church Facebook Page. 27 and the satraps, prefects, governors and royal advisers crowded around them. They saw that the fire had not harmed their bodies, nor was a hair of their heads singed; their robes were not scorched, anthere was no smell of fire on them.